It is with great sadness and heavy hearts that we announce the sudden passing of our beloved mother, grandmother, sister and friend Shirley Ann (nee Yanisiw) Yaroshinski at the age of 68 on September 22nd, 2018. Shirley was predeceased by her parents Tillie and Stanley Yanisiw, brother-in-law Peter, brother-in-law Ted and sister-in-law Pat. Shirley will be lovingly remembered by her children Darrell (Kim), Keith (Cynthia), grandson Ben (Lera), and her siblings Joe, Mary, Lillian, Diana, William (Barb), Elaine (Brian), Sharon (Fern) and their children. Shirley was born on June 11, 1950, and was raised in East Braintree, Manitoba and then moved to Winnipeg as a young mother where she raised her beloved boys and made a career for herself at the Canada Revenue Agency for over 20 years. Shirley loved to travel and go on adventures, whether it be cross country road trips with her young boys, pop-up camper in tow, or adventures with her sisters. Shirley had a talent for making crafts and took pride in cake decorating. Shirley loved music, going to concerts, gardening, outings to the casino, but most of all spending time with family and catching up with old friends. Funeral service will be held Saturday, September 29 at 2:00 p.m. at Sobering Funeral Chapel, 1035 Park Ave., Beausejour, Manitoba. A luncheon will follow in the Beausejour Room, Brokenhead River Community Hall. A private family interment will follow at St. Mary’s Riverside Cemetery, Prawda, Manitoba. Our thoughts and prays are with you all. Keith – we are very sorry to learn of your mom’s passing. Please accept our sincere sympathy and know that we are thinking of you. 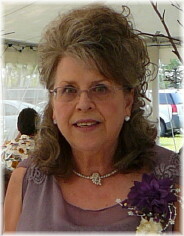 Our hearts are saddened by Aunt Shirley’s passing and our thoughts and prayers are with all of you there in Winnipeg. So sorry to hear of Shirley’s passing. we met years ago at the Whitemouth Craft Sale. We met again at Cancer Care in St. B hospital where we shared experiences with our encounters with “the disease”. She phoned a month or so ago to inquire about the next craft sale. Such pleasant caring lady to talk to, with such a positive attitude. My deepest condolences to her family. So sorry to hear of Shirley’s passing. Received obit from my siblings John and Ann. Bless her to be relieved of her pain and discomfort.